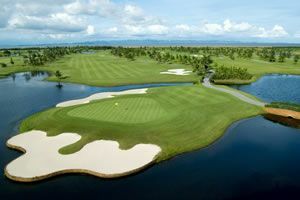 I recently hit my ball into one of the many bunkers lining the fairways at Springfield in Hua Hin. I thought it might be buried but I couldn’t see it. I finally found what I thought was the ball! My playing partner told me I could sweep away some sand to check it was mine would be allowed to recover the ball with sand and play it without penalty! This I did and finished the hole with a solid bogey! On that note if your ball lands in a bunker, you have a decent lie and the caddie passes you your sand wedge. You are set up to splash it out but a gust of wind rises up and a piece of coconut shell lands behind your ball. If you choose to move the coconut shell and play your shot, it will cost you two shots, according to Rule 13-4/18.5. The rule states you have to play the ball (and the coconut shell) as it lies. 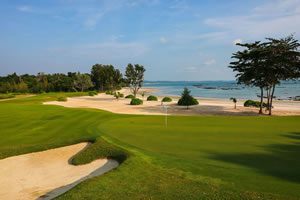 Golfers in Thailand often choose to play early to avoid the heat! You do get the early morning dew here and if you are in the habit of wiping that dew off with your towel or your shorts you are in violation of Rule 13-2. Dew-wiping is a two-shot offense. Who’s Ball Is It anyway? A running theme here but you’ve just played one of your lucky golf balls with a “3” on it into the bunker. Next shot you’re playing partner hits his ball into the same spot. You get up there and low and behold you are both playing a ball with “3” on it! Neither one of you put a line, star or smiley face on it so what do you do? Rule 12-2 states that both balls are viewed as lost and both players are penalized a shot and need to go back to play their previous shots. Unlucky! In the unlikely event you hit your ball offline and it hits your opponent and the ball ricochets out of bounds there is no penalty! You are allowed to replay your shot. Just don’t forget to apologize to the unlucky player!